I love to cook. I love to try out new recipes. But I HATE doing dishes. I hate soaking a pan and then scrubbing it and then repeating the process until it’s finally clean. Nothing is a bigger demotivator than thinking about the clean up. With Copper Chef you’ll never spend the night scrubbing a pan again. NEVER. 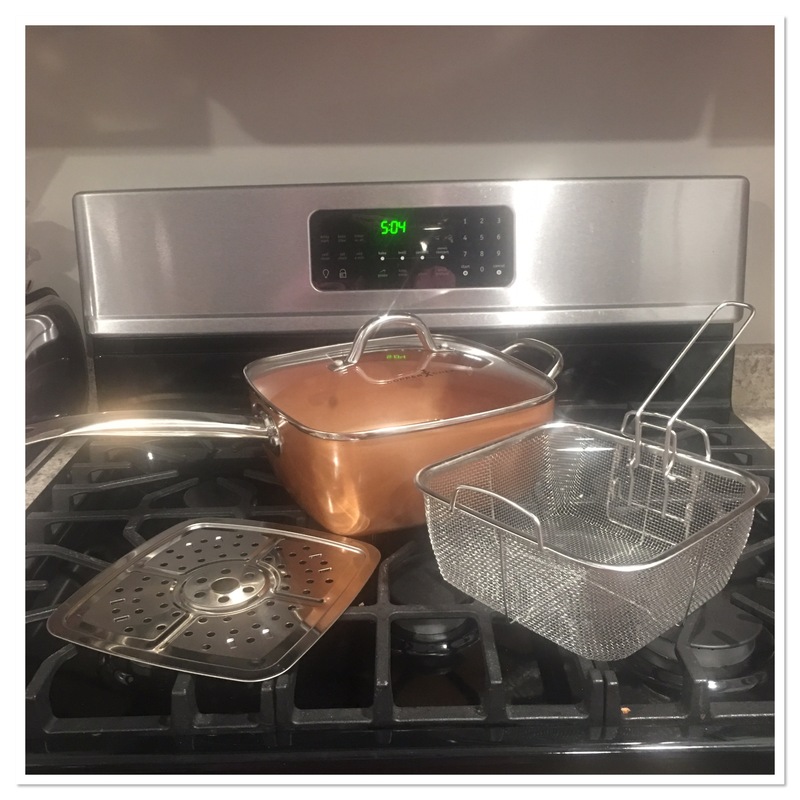 I’ve been using the Copper Chef pan for a few weeks now and I am extremely impressed. With other pans, I need to add oil or butter to help prevent the food from sticking to the pan. I did not have to add any oil or butter with the Copper Chef. And I can put the Copper Chef pan in the oven! How crazy is that? The first time I used the Copper Chef pan I tried to make some roasted potatoes. Typically, I toss them in olive oil and season them, place them on a baking sheet and cook for 45 minutes. They turn out ok but if some of the potato pieces are small they can burn. This time, I browned my potatoes on the stove top in the Copper Chef pan. That’s right, I did it on top of the stove! I did add a little bit of butter for flavor. Once the potatoes were brown I put the pan in the oven and finished roasting the potatoes. The Copper Chef pan went directly from the stove top to the oven. When I took the potatoes out they were perfect! Each potato was cooked till they tasted like mashed potatoes on the inside but had this beautiful golden brown outside. And the butter made them taste like buttered mashed potatoes! My daughter loved them. This morning I used the Copper Chef pan to make blueberry pancakes. Normally, blueberry pancakes can make a mess. And when the blueberries are burned onto the pan it can be a tough mess to clean up. With the Copper Chef pan, I didn’t have to use butter or oil. At all! I simply heated the pan and poured my blueberry pancake mixture in. Each pancake came out golden brown with not one blueberry scorch mark. And when a blueberry did burst open and burn in the pan I took a paper towel and wiped it out. Easiest cleanup ever! Copper Chef has made mealtime clean up a snap! Plus I can cook so many dishes in just this one pan. I think tomorrow we are going to make the macaroni and cheese, in the Copper Chef. One pan is all I need! If you are looking for a pan you can use to bake, fry, broil, saute, steam and braise look no further. I can do all this in my Copper Chef pan.